Greetings again from Chiropractic Help. Firstly a small change in the layout of this newsletter, and an explanation. After the first two or three days, old newsletters are obviously old news and draw little traffic. So, after an introduction, this page will lead you to a permanent page at the site that holds more interest for new viewers. As you realise, I'm sure, the contents of these newsletters come directly from interesting issues that arise at the Chiropractic Coalface. This month is all about the use and misuse of diagnoses. Spring is in the air in the northern hemisphere and one of the things I recommend is that you think about a sunny corner of the garden to grow one of my favourite herbs. Sweet basil. Once the danger of frost is over, dig some compost into a patch of ground about a metre square. Buy half a dozen sweet basil seedlings from your corner gardening shop. They grow like weeds, no fuss. I make fresh pesto at least once a week, often twice, right through the summer. It takes only five minutes and it really turns a boring salad into a delicious meal. Here it is on the left, and I usually go straight on and make our other firm favourite, hummus, on the right. There's been a lot of research done on sweet basil. It's rich in substances called flavonoids that protect the cells in your body against radiation and cancer. Flavonoids are just one of many healthy substances in fruit and veg, together known as phytochemical foods. Tired of being sick and taking so many drugs? Make sure you are getting these rich substances in your diet every day. Yes, it takes a little time to make up a salad, or a smoothie, or rustle up some pesto. But a lot less time than you're spending in your doctor's office? 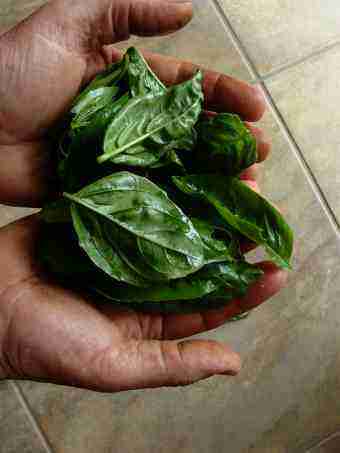 Just take a handful of sweet basil and scrunch it up in your hands. It releases the most amazing scent; a rich aroma of volatile oils that have been proven, reported in the Journal of Microbiological Methods (July 2003) to inhibit the growth of several serious bacteria like Staph Aureus, enterococcus and pseudomonas that now are resistant to many drugs. One of those divine smelling oils, eugenol, has been proved to inhibit a highly inflammatory enzyme in the body known as COX in the same way as NSAIDs do, and hence of course the place of pesto in a chiropractic website. Bruise easily? Sweet basil, along with parsley is one of the richest vegetable sources of vitamin K.
Traditionally, pesto is made with pine nuts but they are expensive and hard to get in South Africa. So I make my pesto with pecan nuts that are readily available. It tastes much the same. You could try walnuts. 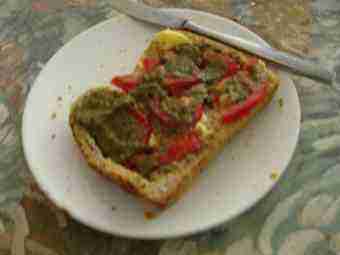 On a tomato sandwich, pesto is absolutely divine. Because these oils go rancid so quickly, you'll find commercial pesto is filled with preservatives that not only spoil its unique flavour but of course aren't healthy either. It takes just five minutes to make your own pesto. Sweet basil is also rich in beta carotene, another powerful anti oxidant that protects the cells of the body from damage. Healthy, delicious and made in a jiffy, pesto is for every household. 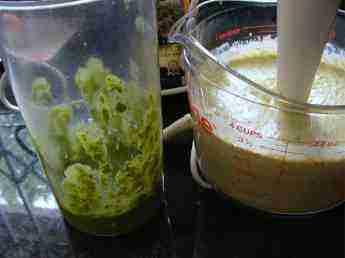 The most trying part of making pesto is cleaning the blender. And in my deep south, autumn is in the air so it's time for the winter veg. Broccoli, the queen of the anti cancer vegetables grows best in the cooler weather, but it must be established before the first cold snap. Choose the branching varieties as, after the main head has been picked, it goes on producing these florets that research shows are even more rich in glucoraphanin, the active ingredient. They are just perfect for making delicious broccoli soup. 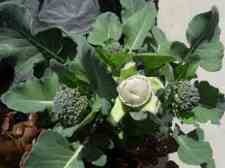 Read more about the cancer preventing properties at broccoli facts. Green peas, lettuce, cauliflower... it's time for the winter garden in the south. Today, the 21st March is equinox day; day and night are equal in length. "Those whom the gods wish to destroy, they first make famous." 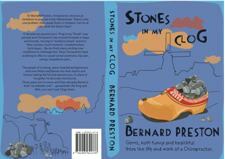 Bernard Preston has no desire to be famous! but it would be nice to sell a few more thousand of my three books of chiropractic anecdotes. "Gems, healthful and funny, from the life and work of a chiropractor" is how they've been described. You WILL enjoy them, or your money back. No one has ever asked, nor will you! Roll on the end of winter and, in my neck of the woods, the long humid and very wet summer. Are you too getting extremes of weather? Just this week we had four inches of rain, 104mm, in a few hours. Global warming IS happening; the icecap IS melting at an unprecedented rate. It probably won't affect our generation that badly but, if we want a world for our children's children to live in, each of us needs to do our bit to reduce carbon emissions. Time to think about solar panels on your home for heating water and generating electric power? Confusingly, my motor mechanic tells me that electric cars actually produce more carbon emissions than petrol. I'm not sure he's correct, but in any event my first electric car will be charged from the PV electric panels on my roof. I'm just waiting for the price to come down.